In this definition essay, a student explores the many meanings of the term romance. 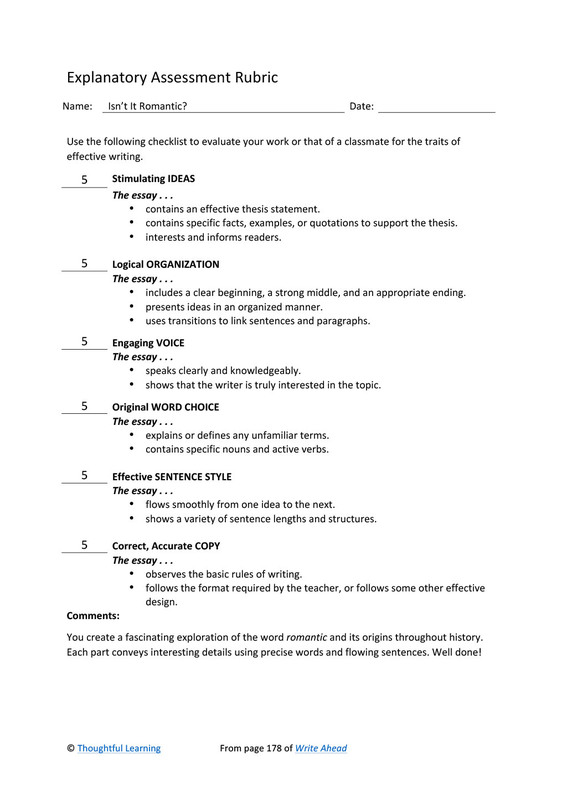 Completed Rubric: Isn't It Romantic? When someone uses the word romance, the images that come to mind are long-stemmed roses, soft music, and chocolates in a heart-shaped box. Romance has more meanings than love, however. It may also refer to a family of languages, a heroic tale, or a particular period in the arts. In the first case, Romance (with a capital R) refers to languages that have descended from Latin. These include French, Italian, Portuguese, Spanish, and even Romanian, among others. Because Latin was the language of the Roman Empire, the term "Romance" reflects those origins. After the fall of the Roman Empire, and during the Middle Ages, fantastic tales of heroism, adventure, and the supernatural became popular in Europe. Troubadours and traveling actors spread stories of noble knights battling evil ogres, dragons, and other monsters. Because many of these tales originated in southern Europe, where the Romance languages were spoken, the stories were called romances. Often, these romances featured a damsel in distress, who was rescued by a knight according to a code of chivalry. In France, especially, chivalric tales became extremely popular. In these stories, knights would dedicate themselves to the honor of a lady, as in the story of Sir Lancelot and Queen Guinevere. It isn't difficult to see, then, where the link between courtship, love, and romance began. Later, during the early nineteenth century, poets such as Wordsworth, Coleridge, Byron, Keats, and Shelley used the term Romantic to refer to a new type of poetry. They were reacting against the previous period, the Age of Reason. Poetry of the Romantic period sought to regain a sense of wonder and intense feeling. It focused on nature rather than on science, on human emotions and human rights rather than on the progres of nations. Romance means much more than just hearts and flowers. It can refer to languages descended from Latin, to heroic tales, and to a particular period of poetry. Running through all of these is the thread of love, so that meaning of romance has its place, too. Isn't It Romantic? by Thoughtful Learning is licensed under a Creative Commons Attribution-NonCommercial-ShareAlike 4.0 International License. Based on a work at k12.thoughtfullearning.com/assessmentmodels/isnt-it-romantic.